General Description: It is an erect, coarse biennial, or short-lived perennial, with a stout taproot. When crushed, a sage-like odor is emitted. The mature plant can reach 3 feet tall. 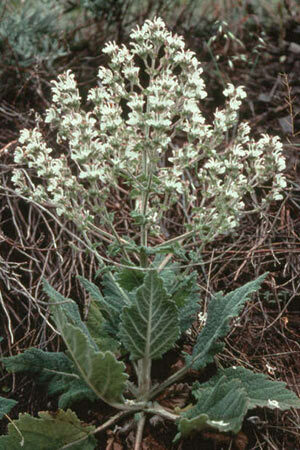 The overall plant is covered with dense, woolly hairs, especially when young. Flower Description: Woolly clusters of four to six flowers are found in whorls at branch tips. Flowers are white to yellowish and about ½ inch long. Two upper petals form a lip resembling a hooked beak. 3 lower petals form 3 lobes, with outer lobes larger than the central. Leaf Description: Basal leaves have irregular or indented margins. They are 4 to 12 inches long and have petioles. Upper leaves are opposite, smaller and they clasp the stem. Uppermost leaves are reduced to bracts with long tapering points and are often tinged purple. Stem Description: Flowering stems bolt as a single, squarish stalk developing into a much-branched inflorescence with many small white flowers that resembles a candelabra. Fruit/Seed Description: Flowers form 4 nutlets, with each nutlet containing one seed.